Keanu Reeves might actually be John Wick in real-life. A new video of Reeves and Halle Berry preparing for John Wick 3: Parabellum features the duo’s impressive firearm skills. Reeves has been known to really throw himself into his roles and has done immense amounts of training for the John Wick franchise over the years, including working on a tactical gun range with real guns, fight choreography, and driving stunts with various different vehicles, which even involves a horse this time around. Keanu Reeves and Halle Berry can be seen at Taran Tactical going through some targets at a rapid speed placed in between footage from the John Wick 3 trailer. Berry and Reeves look like the training has paid off as they receive encouragement from their trainers and each other. In a separate video posted on social media, Reeves can be see beating a previous record for speed, breaking 5 seconds. When the actor here’s the news, he strikes a rare giant smile. Halle Berry is joining Keanu Reeves in John Wick 3 as Sophia. In addition to her firearm training, Berry worked with a dog trainer to get her character’s dogs into shape. One look at that recently released trailer shows that those two dogs are going to play a large and vicious role in the movie. Berry worked on her stunt fighting too, and just like Reeves, she performs many of her own stunts. Basically, it wouldn’t be too wise to approach either Reeves or Berry and challenge them to a traditional fight or a gun fight. John Wick 3 director Chad Stahelski has teased that this will be the biggest and bloodiest movie out of the whole franchise, which sounds intense since the previous two installments have been big and violent. For fans thinking that this might be the end of the road for our favorite assassin, Stahelski says that he and Keanu Reeves have plenty of ideas to keep the franchise running indefinitely, but that will all depend on the box office earnings for the upcoming third movie. Excitement for the project is pretty high, so one can imagine that we’ll get to see Reeves back in training mode in the near future. John Wick 3 hits theaters on May 17th and it should go on to repeat, if not beat, the success of the previous two movies. 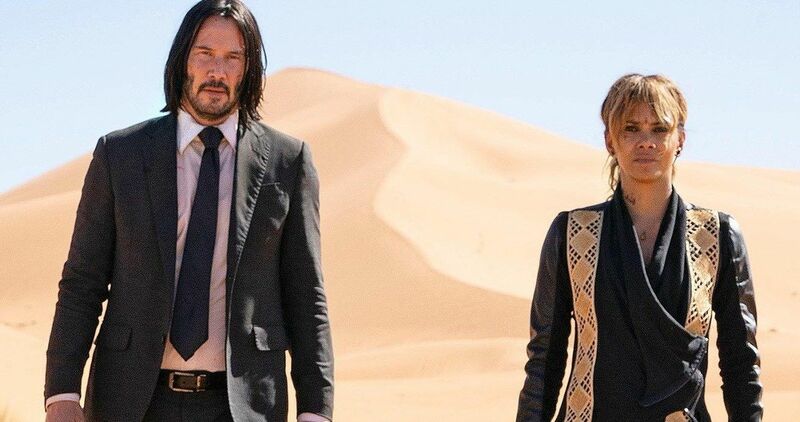 Like Chad Stahelski said, the trailer proves that everything has been ramped up considerably for the third chapter, including the crazy firearm training that Keanu Reeves and Halle Berry went through this time around. It would be pretty interesting to see their skills tested outside of the entertainment industry to see what they picked up on from working with experts. While we wait for John Wick 3: Parabellum, you can watch Keanu Reeves and Halle Berry take out some targets below, thanks to the Taran Tactical YouTube channel.